Zugibe, though relativelynew to the scene, has been a winery producing serious wines for serious wine drinkers. In June of 2005, in the Finger Lakes, on the banks of Seneca Lake, Zugibe Vineyards began as 23 acres of vinifera wine grapes. Since then, Zugibe has grown to 40 acres, comprised of 11 different varietals, including Riesling, Cabernet Franc, Cabernet Sauvignon, Pinot Noir, Gewurztraminer, Pinot Gris, Chardonnay, Merlot, Lemberger, Sauvignon Blanc and Gruner Veltliner, an Austrian varietal. On November 20, 2006, they lost their father, Frederick II, suddenly and unexpectedly. His drive and passion for Zugibe Vineyards, and indeed, for all of his endeavors, continues to serve as an inspiration to all of his sons. The three Zugibe brothers - Frederick III, Brendan and Sean - each brought to this venture different yet complementary knowledge and experience. 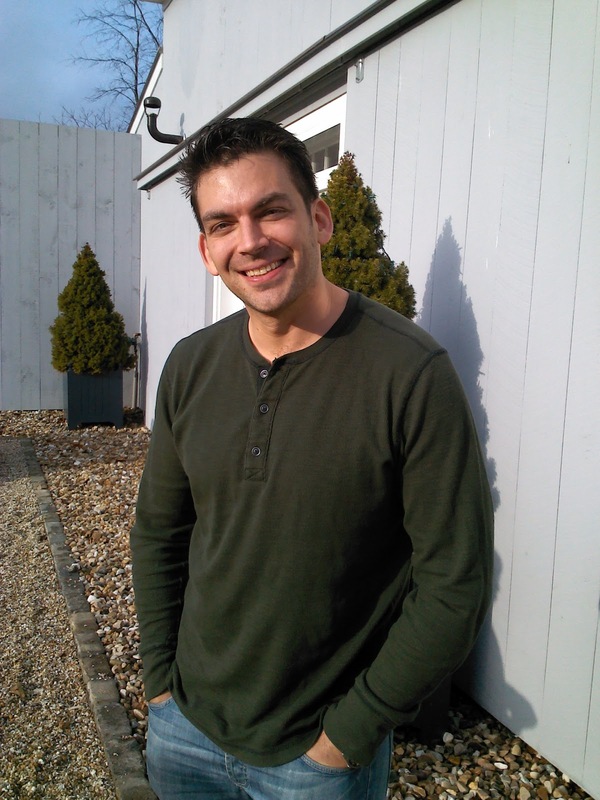 Frederick is a trained oenologist, Sean a viticulturist, while Brendan's background lies in business. All three, however, along with their parents, Frederick II and Anna, shared a passion for exceptional wine, and a desire to create their own unique blend. I recently tried the wine at the Governor’s Summit for wines, beers, and spirits in Albany this past fall. 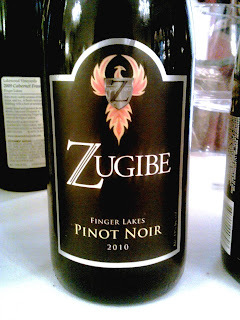 The Zugibe Pinot Noir 2010 was extremely smooth. The nose had cherry, strawberry and cassis, all as promised. A hint of spice and vanilla too! The wine had a lovely bright to medium cherry, with nice acidity and relatively low tannins. 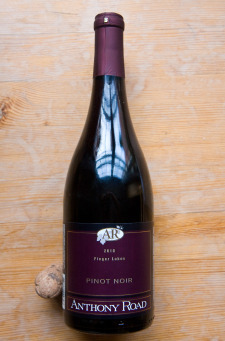 It was a very nice Pinot Noir! 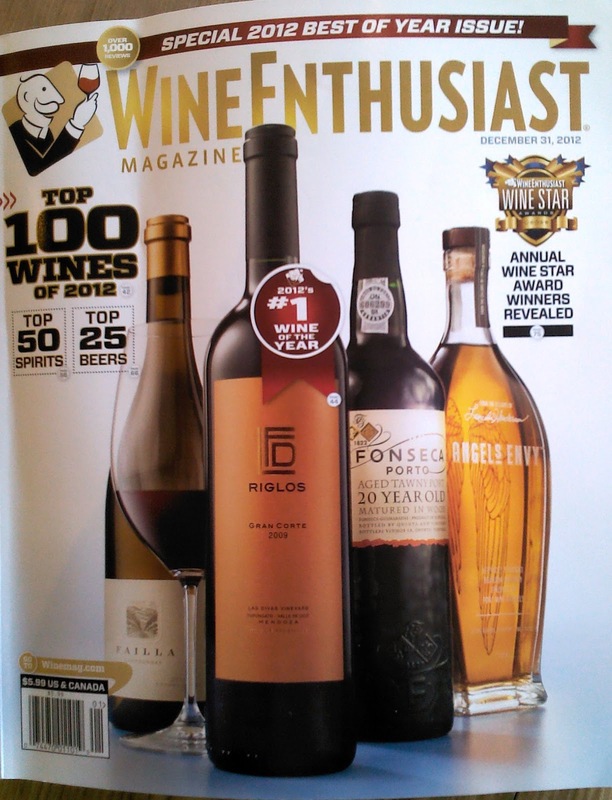 Congrats to all three brothers…this is a wine to be very, very proud of!!! In 1986 Ron Goerler Sr. acquired the 150-year-old barn that houses the winery and tasting room Drawing on our exceptional Cutchogue Vineyards fruit supply as well as the talents of his son, Ron Jr., he started Jamesport Vineyards in 1989. Since then, a lot has changed, both aesthetically and agriculturally. 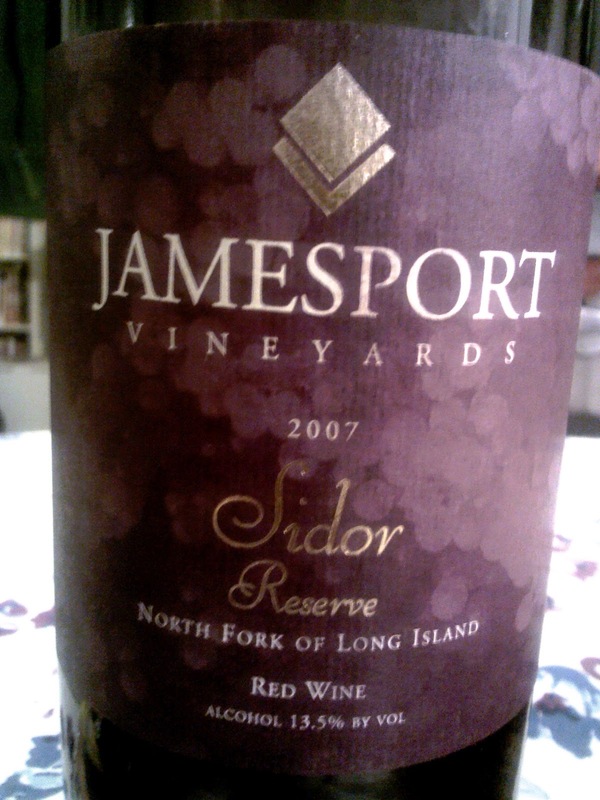 The Jamesport Vineyards 2007 “Sidor” Reserve Syrah is a blend of 62% Syrah, 18% Cabernet Sauvignon, 9% Cabernet Franc, 9% Merlot, 2% Petit Verdot . 300 cases were made. 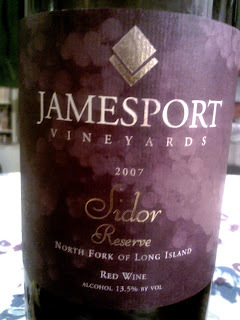 The wine is called “Sidor” because it comes from their Sidor Farm in Mattituck. Mocha and figs come through as promised, as well as cassis, spices, and minerals. Plums and pomegranates too! Blackberry and pencil shavings as well. This is an incredible wine. Big, deep, aromatic, and flavorful!! Amazing! Fantastic! 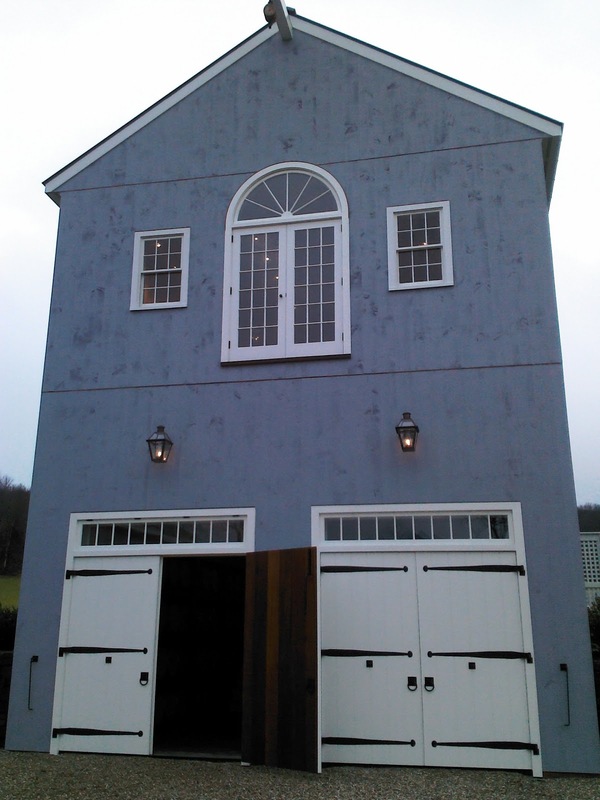 Congrats to the Groelers and to the folks at Jamesport Vineyards! I must say that I am not much one for wassail and flavored wines of the kind. But I did do a tasting at Kreutz Creek sometime ago and came away with a bottle of it that I laid down in my cellar and forgot about. Jim Kirkpatrick is the winemaker for Kreutz Creek Vineyards. He started making wine from a kit that his wife, Carole, gave him for his birthday in 1989. (Carole truly believes that’s how the “monster” was created.) Since everyone liked the wines from the kits, Jim and Carole thought they would try their hands at growing grapes. 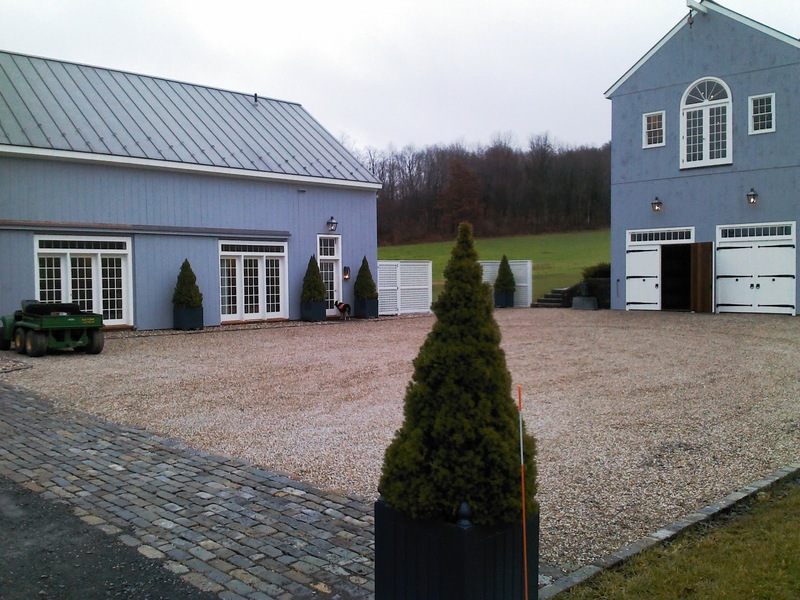 They moved to another home with 3 acres of land in Wrightsville, Pennsylvania where they started a small vineyard. 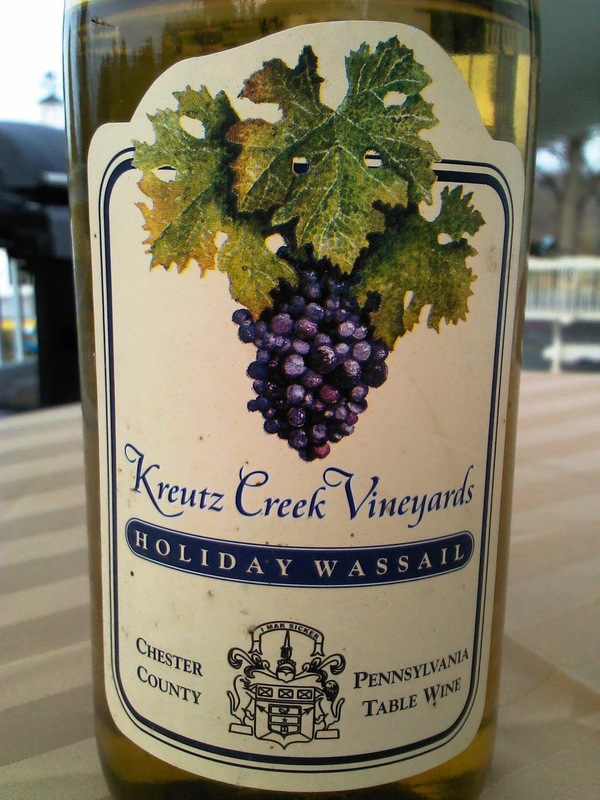 Their home was located 100 yards from Kreutz Creek — hence, the vineyard was named. 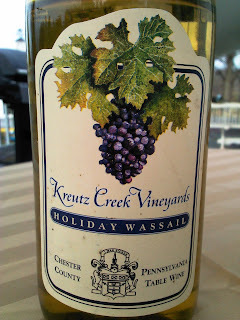 Kreutz Creek Holiday Wassail is made with Niagara, pumpkin, cloves and cinnamon. Some people like it heated, some prefer it chilled. I drank it chilled. It was fun and fruity, with a nice acidity that balanced the sweetness and other flavors. It was a lovely wine to have with some locally made cheddar. I was impressed. The wine delivered. About a couple of months ago, Dominique and I were thinking about having something a little different with dinner. I decided to comb the wine cellar, looking through a bunch of different bottles. And suddenyl I remembered that it was Nouveau Seaon, and so went to that area to dig something up. And there I found a Nouveau....a Crossing Vineyard Nouveau...from 2006. Wow, the "new" in that was more like..."whoa!" By 2012, one expected, that the wine was past drinking. We opened it more as a curiosity than as a selection for dinner. There was still a bright cherry and saoft strawberry to the wine up front, tinged with a slight hint of vanilla. 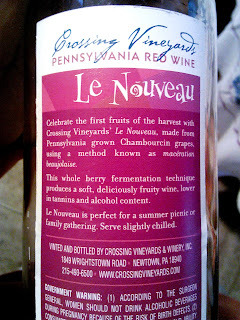 The wine is made using the classic French techniques of whole berry masceration and is the first wine made from the most recent harvest. It's meant for immediate drinking. But I have to say, this wine had indeed held up! It was absolutely lovely, even six years on! We ate it with roast chicken and roasted vegetables. It was perfect!!! Congrats to Tom Carrol (Sr. & Jr.) and everyone else at Crossings Vineyards!!! MONMOUTH COUNTY — The fledgling vines taking root on a hillside in West Long Branch are small and bare and don’t look like much yet. But in a few years, their grapes are supposed to make the first 300 or so bottles of Monmouth University’s own wine. The project — dubbed the MU Vineyard — was planted this spring by students at the private college. The rows of vines on the lawn of the university president’s house are designed to be a living laboratory for science students. Once the first vintage is ready, campus officials hope art majors will design the labels and marketing students will help sell the bottles. Though most college students know more about beer than fine wine, biology major Mitchell Mickley said his classmates at the 6,500-student university are excited to see a vineyard taking root on the edge of campus. "Their faces kind of light up when they hear about it," said Mickley, 21, a junior from Howell who helped plant the vines. 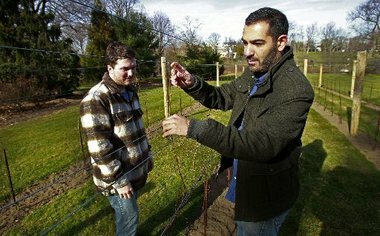 Pedram Daneshgar, an assistant professor of biology in his third year at Monmouth, came up for the idea for the vineyard after attending a conference where he heard that creating a campus-wide project could be used to teach students across majors. Wine was the first thing that came to mind, the assistant professor said. "I wanted to do something I thought kids would be interested in. So, I picked wine growing," Daneshgar said. Monmouth University President Paul Gaffney offered to let students use the lawn of Doherty House, the presidential residence, to plant the vines. The spot was perfect because it is secluded and the gentle slope will allow water to drain, Daneshgar said. Because students provided free labor, the university spent only about $2,000 to buy and plant 100 vines, campus officials said. 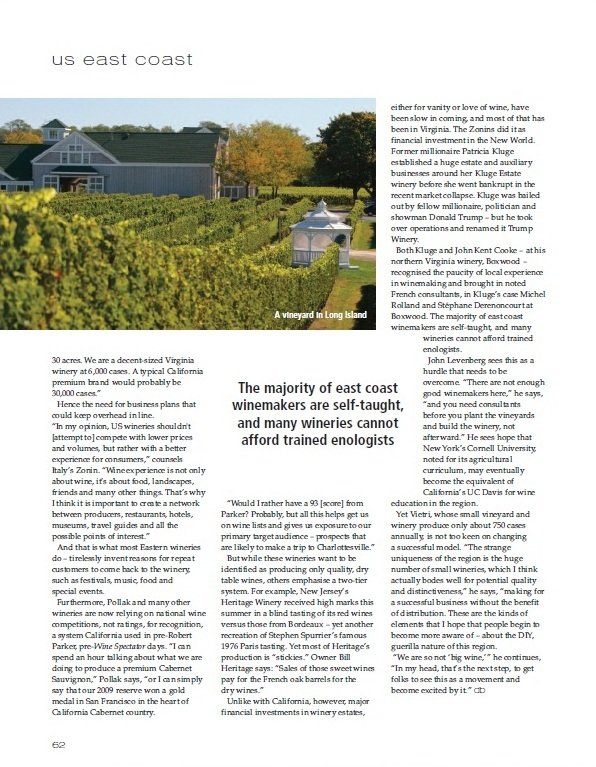 They ordered 1-year-old Cayuga White and Chambourcin vines from a New York grower, because the red and white varieties have been grown successfully in Monmouth County. The vineyard is expected to grow more costly in three or four years when the first grapes are ready to be harvested and made into wine. University officials hope donors will fund the fermenting and bottling equipment needed to make the site a full-fledged winery. Janet Giunco, one of the owners of 4JG’s Orchards and Vineyards in Colts Neck, thinks their chances are good..
Giunco and her husband, an adjunct professor at Monmouth’s business school, are serving as consultants on the project. They gave students a tour of their 40-acre vineyard, a tutorial on the basics of wine making and advice on which grapes to plant. Giunco, a member of the Garden State Wine Growers Association, said she was excited to see students learning about wine production. "New Jersey’s wine growing industry has been growing exponentially," Giunco said, noting the state’s wineries have doubled to nearly 50 in the last decade. "We need talent to run them and maintain them." Monmouth joins several colleges around the country planting vineyards as teaching tools. Napa Valley College in California and Cornell University in New York run sizeable vineyards. A group of Oregon community colleges also broke ground on a $7 million teaching winery a few years ago. Other schools with wine-making majors, called viticulture and enology, plant vines for research purposes. Before approving the vineyard idea, Monmouth University administrators said they weighed whether it was wise for a school to get into the alcohol business. "Part of our messaging to college students is the legal and responsible use of alcohol. We ought to be modeling that at all times," said Michael Palladino, dean of Monmouth’s School of Science. "This is mature, responsible use of alcohol." The vines are each expected to produce between 8 and 12 pounds of grapes a year. But the Monmouth students have already run into several challenges. The wind and rain from Hurricane Sandy stripped the vines of their leaves in October, though the plants did not appear to suffer any long-term damage. The vines were also infested with Japanese beetles, forcing students to set traps and remove the insects from the plants by hand. It remains unclear whether the Jersey Shore campus, located about a mile from the Atlantic Ocean, is the right environment to grow grapes. Campus officials said their are lessons to be learned from the experiment, even if the vineyard fails. "It’s all part of the learning curve," Palladino said. "It’s going to be fun for these guys, either way." Candia Vineyards, a boutique NH winery located near the Seacoast Wine trail in Candia, New Hampshire, is excited to announce the holiday availability of two award-winning dessert wines. Candia Vineyards, an award-winning boutique NH winery specializing in the production and vintage of fine grape table wines, is ready to enhance the chilly nights and social occasions of the approaching holiday season with two varieties of critically-acclaimed dessert wines. The Black Ice and Ice Storm labels are a favorite in national and international competitions, and can provide the perfect finish to a special holiday meal - or just go great around a cracking fireplace. 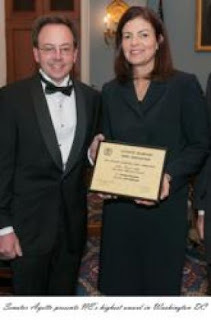 Candia Vineyard was recently the only New England winery recognized by the Congressional Wine Caucus in Washington DC. Their dessert wines are the best in their category in tasting competitions representing the wines of sixteen different countries, and the Black Ice and Ice Storm varieties were chosen from a selection of 3,500 wines as the superior product. 80 judges from around the world made the final decision to elevate Candia Vineyards to the top of the class. Candia Vineyards has received critical acclaim of their wines before, holding world-class medals for many of their products. 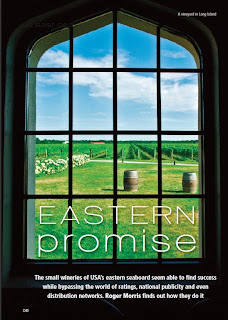 In fact, the winery produces the only world-ranked label of wine in the New England area. Their products are made entirely from area grapes, with no added fillers or flavorings to hide the bold flavors of handpicked fruit. The vineyard hopes to deliver a product to loyal regional customers that conveys a dedication to hard work and the history of the land they farm. 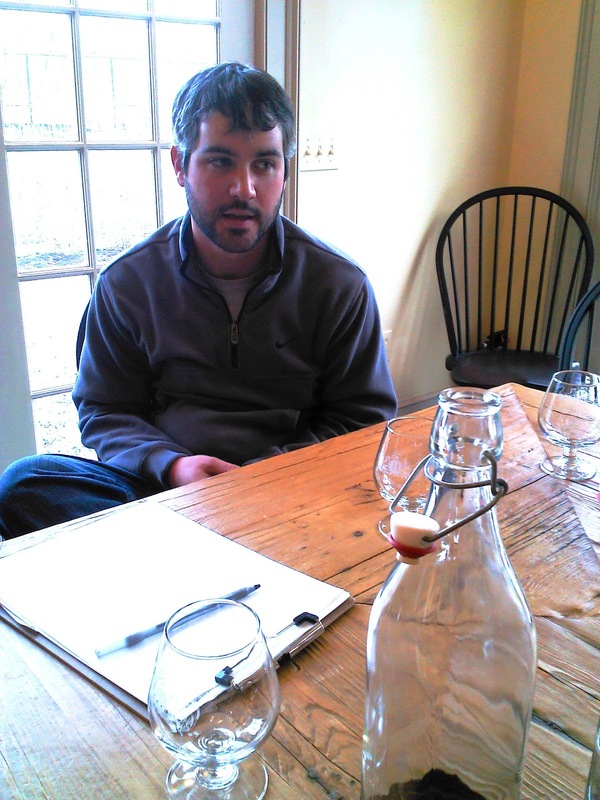 The experts at Candia Vineyards love wine, but they also love pairing good food with wine. By making the choice of a Candia label to pair with the correct flavors and dishes, their wines are designed to turn a good meal into a memorable experience that lasts a lifetime. This holiday season, the craftsmen at Candia Vineyards hope the award-winning Black Ice and Ice Storm varieties keep area connoisseurs jolly, but the vineyard knows that the benefits of good, local wine are a gift that keeps giving all year around. On a recent trip to the NH Liquor & Wine Outlet we saw an ample selection of New Hampshire wines which were featured prominently. Here are five of them in no particular order. 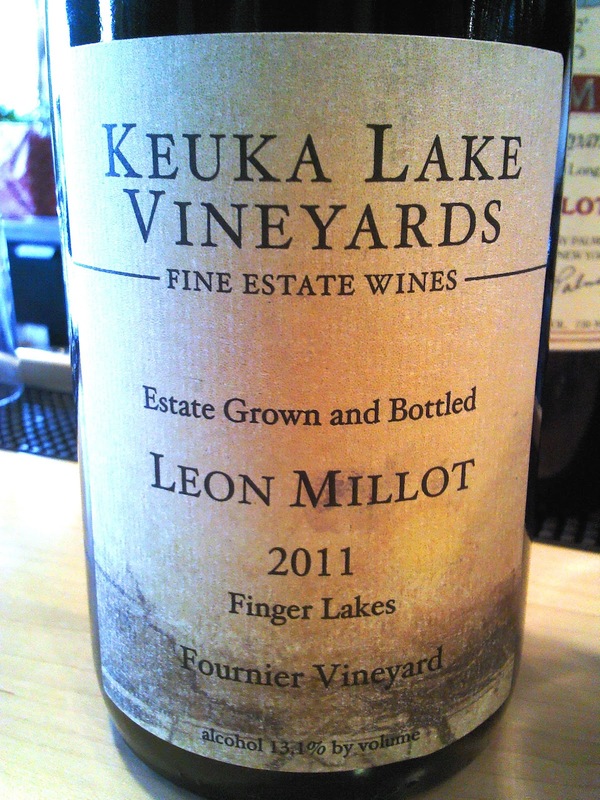 Keuka Lake Vineyards Leon Millot 2011 - They Do It Again! 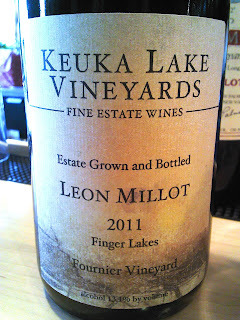 Earlier in the year I wrote (as did everyone) about the fantastic, major award winning Keuka Lake Leon Millot 2010. It was fantastic! And it was a hybrid red wine that was named best red in the state at the NY Wine & Food Classic 2012!! 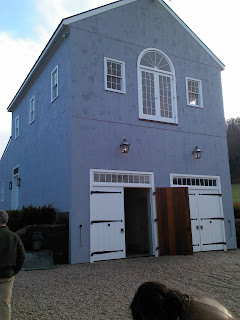 So, while I was up in the Finger Lakes last week, I tasted some wines, as you might expect. While at the New York Wine and Culinary Center in Cananadaigua, NY. I tasted the wine with New York Wine and Grape Foundation President, Jim Trezise, there in the tastingroom of that wonderful facility. 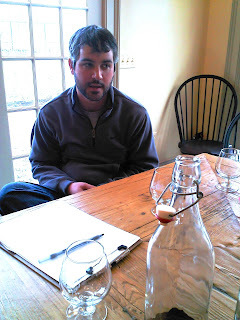 The first big Leon Millot I liked was from Altamont Vineyards, just outside of Albany. Their reserve was fantastic. And the previous vintage of Keuka Lake Vineyards was a revelation. Now, suddenly, I see others. The irony of the tasting was that the winemaker himself, Ian Barry (who is now at Villa Belangelo), tasted the final bottled version of the wine just less than a half hour after I did, in the same room! We missed each other by 15 minutes! As you may recall, this was the famous Fournier Vineyard, originally planted by the famous French winemaker of Gold Seal Champagne, Charles Fournier, who also gave Dr. Konstantin Frank his start. 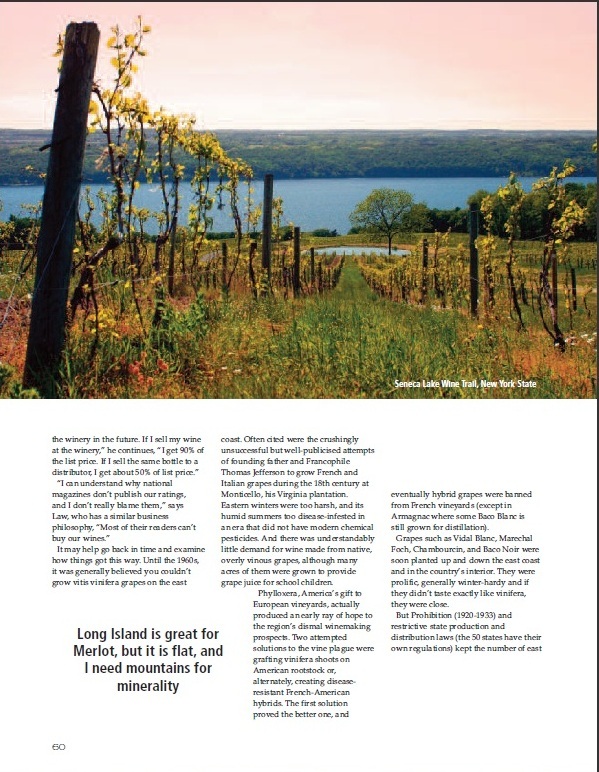 Keuka Lake Vineyards is a small, quality producer. I am a big fan. 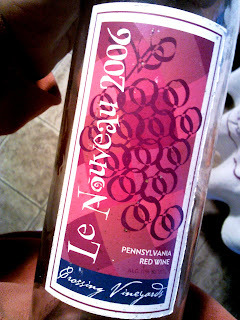 Again, small lot, old vines, done very much in a Burgundy style, aged in older to neutral French oak. Lots of dark berries...blackberry, dark raspberry, a hint of cassis, with vanilla and other spices. It's big, dark, inky, but with wonderufl flavor and nice acidity. The tannins were solid, but did not overwhelm the wine. I liked it alot!! As much as last year's! Cheers to the folks at KLV and to Ian! Drink up!!!! 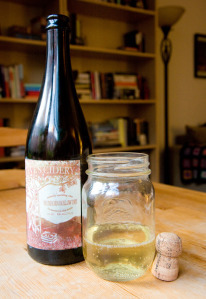 There are those who call cider “blue-collar champagne.” Like champagne, cider is bubbly, often dry, and generally golden. And, until prohibition, cider was the most popular beverage in the United States. Today having a glass of cider almost feels like a political act: with so many beverages available to us, choosing one that’s been around for more than 1,000 years feels radical rather than retro. Eve’s Cidery makes its fermented artisanal ciders and fruit wines on a family-run orchard in the Finger Lakes region. Varieties include the salty Northern Spy and true-to-its-name Bittersweet (a bottle will set you back about 15 bucks). 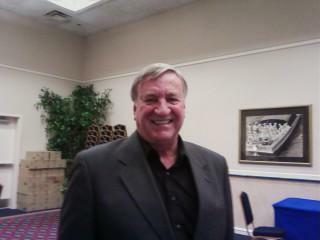 John Martini sets up his stand on Saturdays. 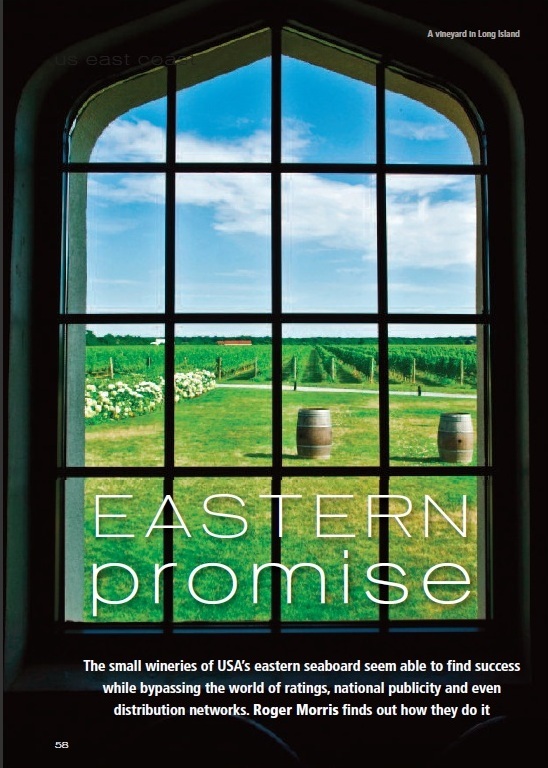 He chats with his customers, offering samples of the award-winning beverages, including chardonnays and rieslings, made by his family-run winery in the Finger Lakes region. All told, he sells about twenty types of wine, one for every year he’s been at the greenmarket. Through the website, you can order wine with personalized labels (most run about $20, and the cost of the special labels depends on how many bottles you want). Or you can simply stop by, mention what you (or your gift recipient) likes, have a few swallows of a nice red or mellow white, and take your choices to go. 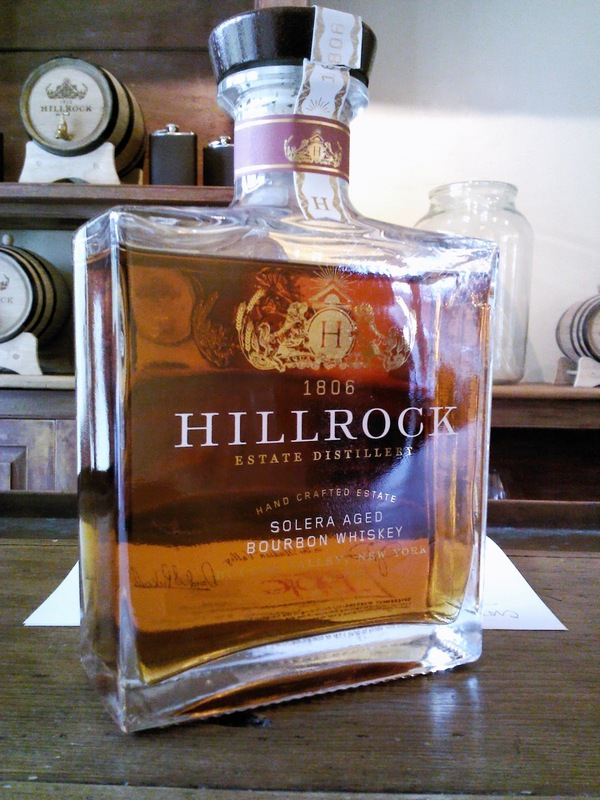 When I arrived on my first visit to Hillrock Estate Distillery in Ancram, NY, I found two people in deep conversation at the table –Jeff Baker, the owners of Hillrock, whom I expected to see, and Ariel Schlein, co-founder and President of Dutch’s Spirits, who I did not expect to see, but was a pleasant surprise. 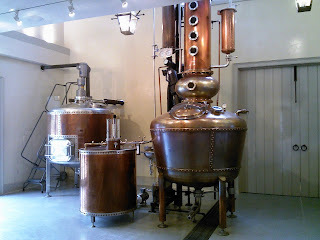 Areil was there to tour the new distillery just as I was. 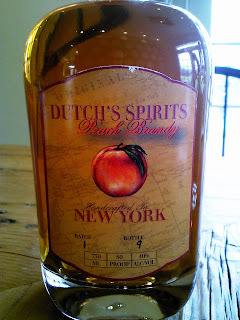 But it was a great introduction to Dutch’s Spirits, one of the other new distillery happening in the Hudson Valley! Since the death of mobster Dutch Schultz in 1935, rumors have proliferated about the whereabouts of his buried treasure up near the craggy ranges of the Catskill Mountains – one of his favorite getaways. 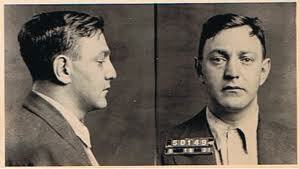 For those uninitiated with Schultz, Dutch Schultz (born Arthur Flegenheimer; August 6, 1901 – October 24, 1935) was a New York City-area German-Jewish American mobster of the 1920s and 1930s who made his fortune in organized crime-related activities such as bootlegging alcohol and the numbers racket. Weakened by two tax evasion trials led by prosecutor Thomas Dewey, Schultz's rackets were threatened by fellow mobster Lucky Luciano. In an effort to avert his conviction, Schultz asked the Commission for permission to kill Dewey, which they declined. After Schultz disobeyed the Commission and attempted to carry out the hit, they ordered his assassination in 1935. You might have seen a movie about him entitled Billy Bathgate. 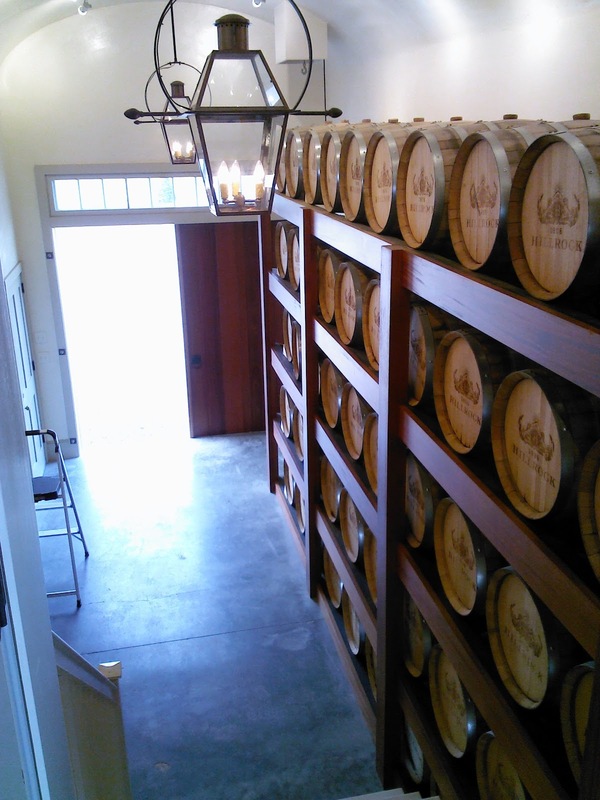 But there’s more to the story than just naming the distillery after a famous mobster. There’s a more interesting tie-in. In 2010, a different kind of fortune was unearthed in the town of Pine Plains, New York. Unlike the many other searches made over the previous decades, here lay a find discovered almost eighty years earlier. Less than a mile from the town center stood a 400 acre swath of land known as Harvest Homestead Farm, owned and operated by the Adams family for generations. It was in the heart of this land, beneath a nondescript bunkhouse atop a hill, that the treasure was buried. It wasn’t the legendary suitcase of gold or cash. It wasn’t a trove of jewels or stacks of bonds. It was a find much more rare and valuable to its beholders. Discovered on this farm were the foundations of a sprawling complex – a clandestine distillery, the likes of which had never been seen before. Despite their best efforts, the production of moonshine in a sleepy country town did not escape detection. After numerous previous failed attempts, just after dusk on Monday, October 17, 1932, Federal agents raided the site. Among the items found were two 2,000 gallon stills in operation, two high pressure boilers, over 15,000 gallons of mash, 10,000 pounds of sugar, two Ford trucks, one Reo truck, and a Lincoln sedan. Two workers were arrested, and two days later, twelve federal agents returned to destroy all of the equipment seized. Over the next 78 years, the farm would undergo many changes. 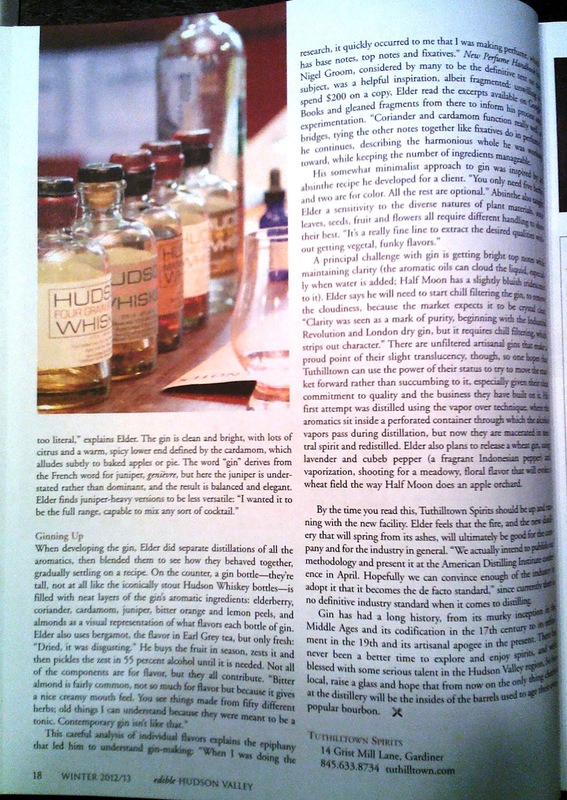 Its owner, Patrick Ryan, was a retired New York City policeman, which may have played a part in his avoidance of prison for harboring the distillery. 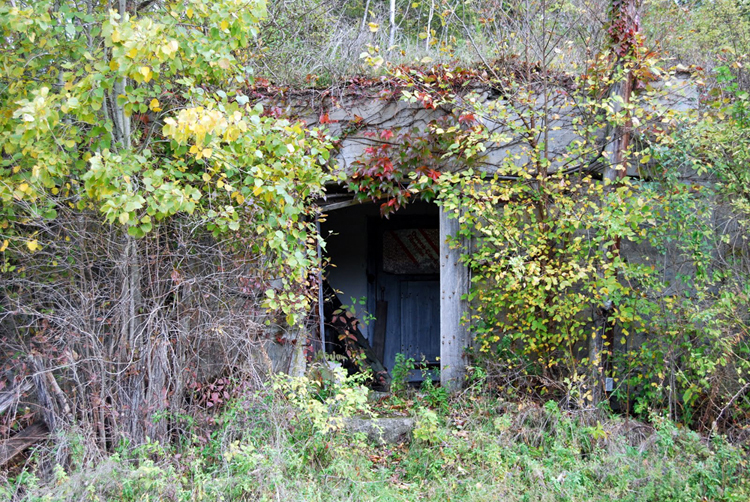 After the raid, he quietly reverted the property back to its turkey farm origins. In 1969, the house fell to Janet and Charles Adams, the same “potato harvester”who had worked at the distillery over thirty years earlier. For forty more years, the Adams family kept watch over the farm and its buried secrets. 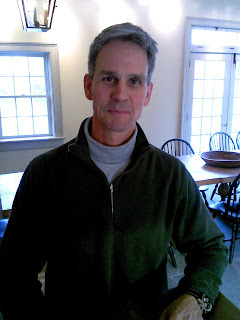 Then, in the Spring of 2008, Charles’s grandson Alex Adams and close friend Ariel Schlein learned of the passage of the New York farm distillers’ law. They decided it was time to write another chapter in Dutch’s history. 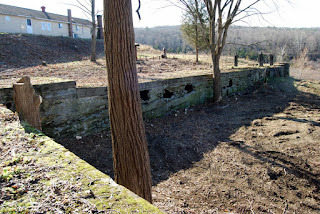 In July 2011, after an extensive archaeological survey and review, the site was added to the New York State Archaeological Inventory as a“Bootleg Era Bunker Complex”, while the New York State Historic Preservation Office deemed it eligible for inclusion in the State and National Register of Historic places. 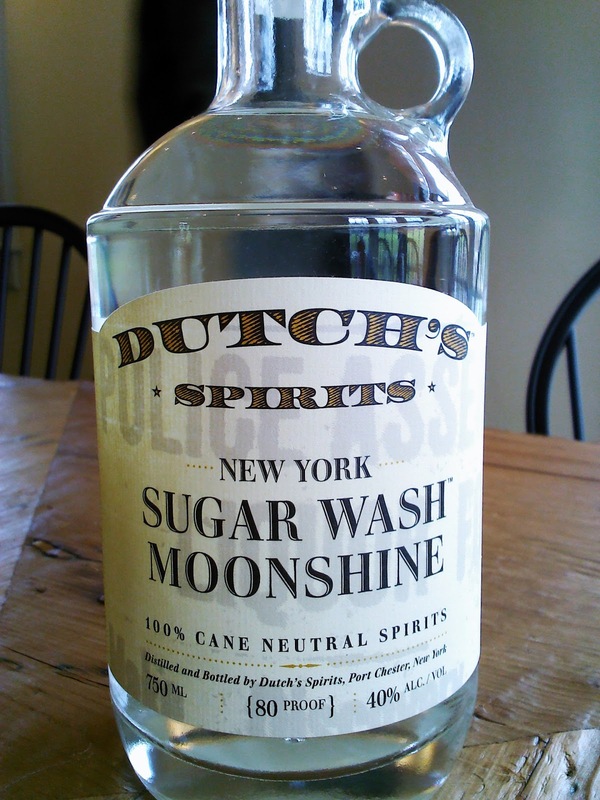 Now, almost eighty years later, Dutch’s Spirits is building a new distillery in the footprint of the original bunkhouse site – the foundations of which are still being unearthed. The spirits were originally distilled and blended at another distillery while the new works are being secured and erected at Shultz’s old “digs.”The new facility will be opened to viewing in the spring, and then hopefully by fall, they will be fully operational…and more importantly, visit-able. The current aim of Dutch’s Spirits? 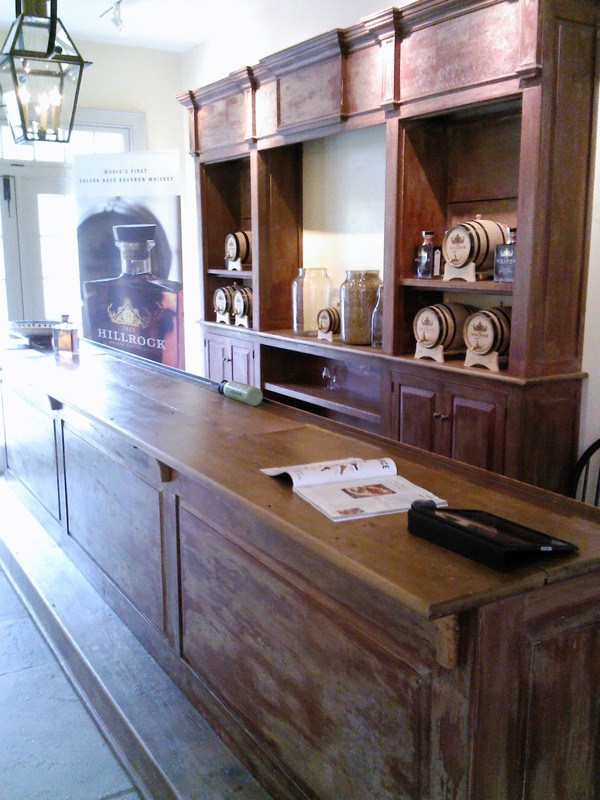 To become a self-sustaining farm operation and agritourism destination specializing in artisanal hand-made spirits. Our first products, produced locally in New York State, include Dutch’s Spirits Sugar Wash Moonshine, Dutch’s Spirits Peach Brandy, and Dutch‘s Colonial Cocktail Bitters. They welcome you to join them on their journey as they rebuild this historic site. Ariel Schlein (Founding Partner & President) is spearheading the vision behind Dutch’s Spirits. An avid triathlete, Ariel has spent years swimming, cycling, and running the Hudson Valley, spawning a well-worn love affair with the land. Owing to his friendship with Alex Adams, his passion for the region and its history blossomed through the discovery of the treasure that lay beneath Harvest Homestead Farm. His free time is spent furrowing through old newspapers, maps, and photo libraries, cornering archeologists, or exploring Dutchess County’s burgeoning food, wine and spirits landscape. Alex Adams (Founding Partner) was born and raised in Poughkeepsie, New York, a short drive from Pine Plains where his family farm –Harvest Homestead Farm – has lain for eighty years. His father, a prominent local land use attorney, was raised near the farm alongside four siblings, two of whom currently call the town home. Alex’s grandfather worked the land as a young “potato harvester” when the original distillery was in production. Ethan R. Kelley (Sales& Marketing) has 18 years of full time experience behind the bar – from nightclubs and pubs to high-end lounges and cocktail havens. Most recently, he was the Beverage Director for Brandy Library in TriBeCa, Manhattan – one of the most revered spirits collections in the world. 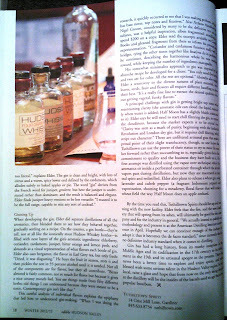 A well-respected teacher on the subject of spirits, Ethan has developed spirits lists for notable bars and restaurants across the country, and instructed members of the industry from bartenders, marketing professionals, and sales forces. The two products I tried were Sugar Wash Moonshine and Peach Brandy. 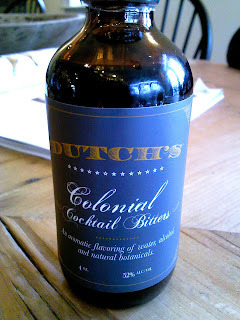 They also make a bitters I didn't get to experience. Very exciting though. It's distributed by a nmber of organizations, especially into the very exciting Manhattan and Brooklyn bar scenes. Schultz's Spirits has plans for a number of other fun and exciting products. Another very cool addition to the very, very hot and happening scene going on in the Hudson Valley, where wine, beers, ciders, and spirits are making a huge impact, and makign the region one of the hottest on the east coast! 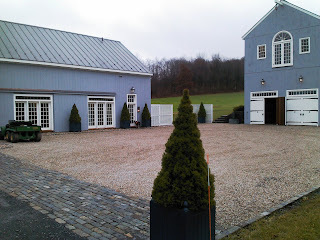 Yesterday, I had the extreme pleasure of visiting Jeff Blake, owner, and Tim Wlley, Head of Operations, at Hillrock Estate Distillery in Ancram, NY. This is a magnificent jewel box of a distillery. According to Jeff, this is the only field to glass, comepletely verticle operation in North America. 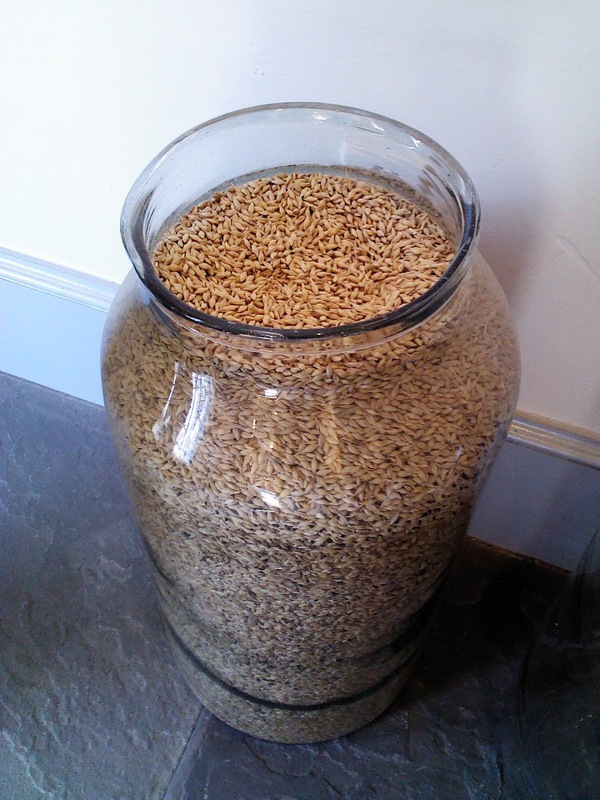 That's right, Hillrock grows it's own barley, wheat, and rye and makes distillates from their own farm grown cereals! Everything about this complex is extremely well executed. For those who have traveled a bit on the east coast, Hillrock is very close to Boxwood (VA) in terms of sheer beauty and sophistication. Incredible! This is a picture of the malting house, where the grains are soaked, and then germinated and and then smoked (when they smoke grains) and kiln dried. 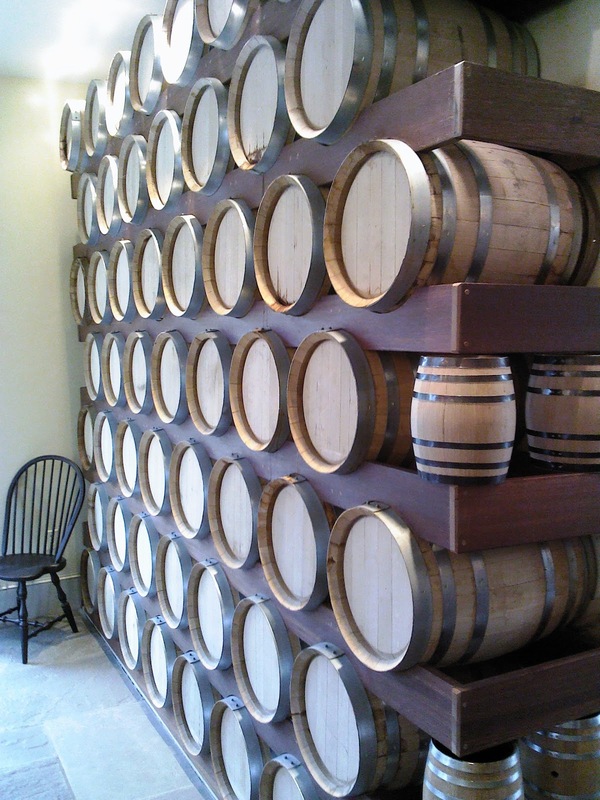 This building is also use for storing whiskey in small casks. The bar is an extremely old bar from an old restaurant in the northern part of back road Dutchess County. Almost 100 years old. This si a small, 10-gallon solera. 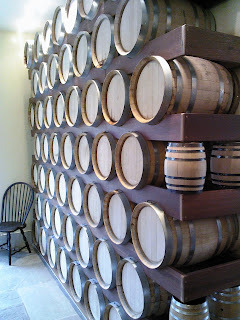 This series of casks is filled, drained, and refilled several times of year. All Hillrock products go through an initial small wood aging before being blended into large quantities. 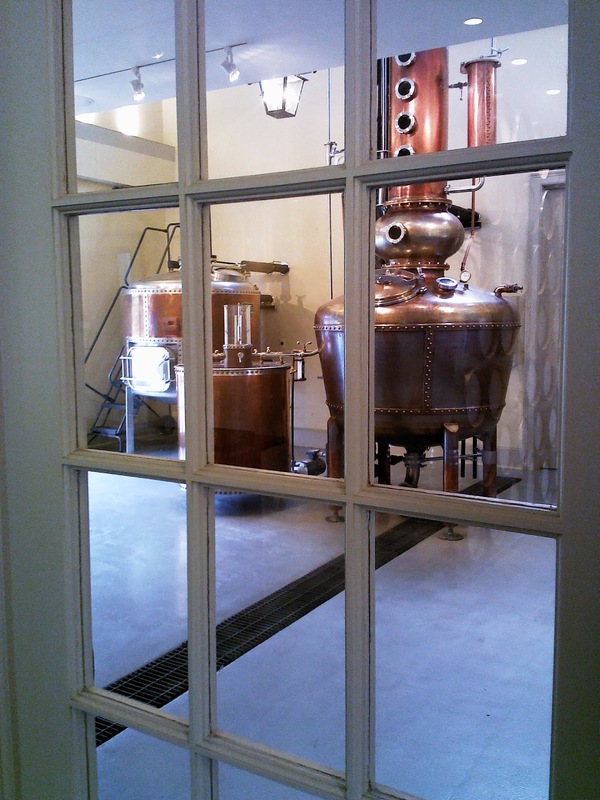 The room with the copper is fantastic, and is showcased just off the bar, through a set of French doors. This is another of the soleras, based in the malting house. 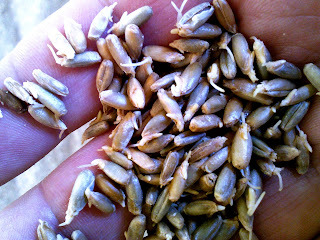 This is grain germinating on the malt house foloor. 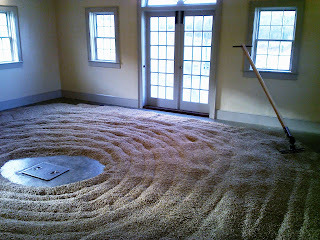 The grain is soaked in warm water, and then spread across the floor, as if in a zen garen. 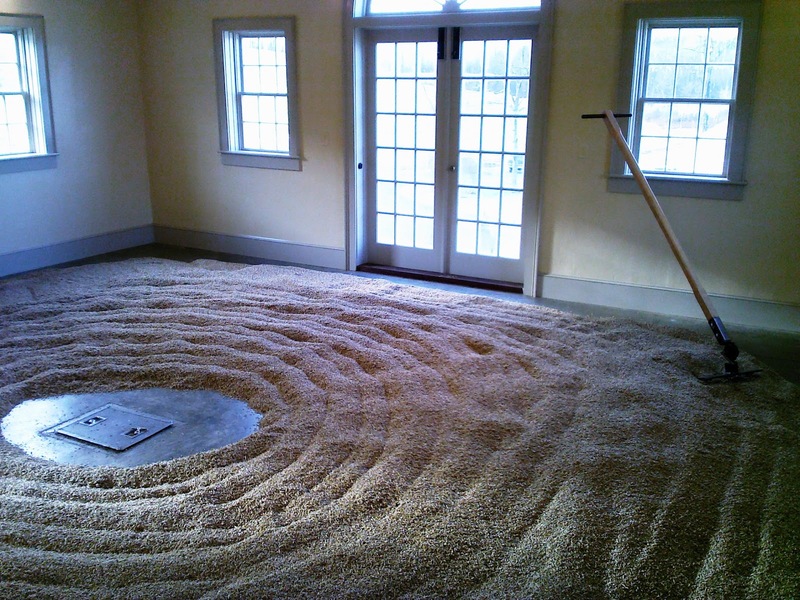 The grain must be raked every 8 hours, for three days. Warm begins to build as energy is expended by the seeds, as they germinated, sending out little tendrils. 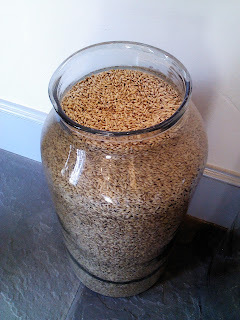 This is a sample of the grain picked up from the floor. You can see the tendrils starting to protrude from the husks. The room smells like oatmeal or bread. 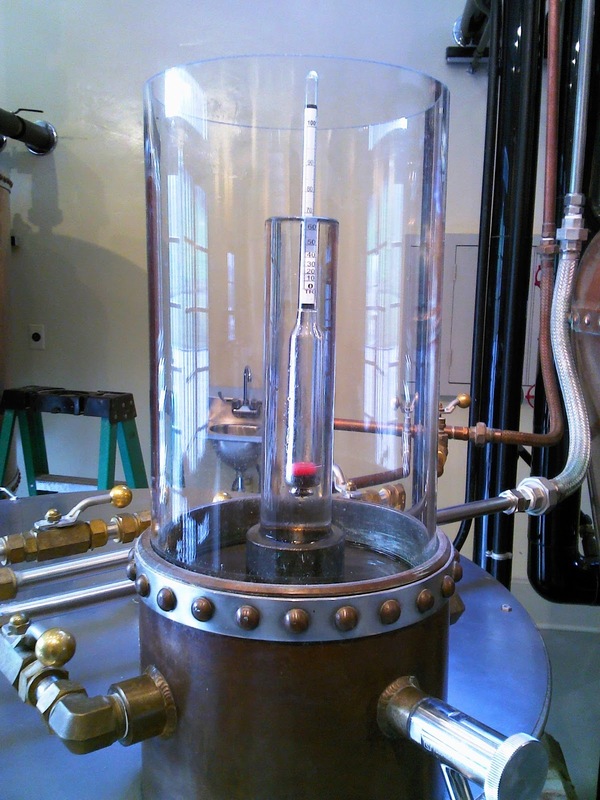 This is a resevoir off the still where the distillate, after running through a condenser, bubbles up before flowing to a large tank. 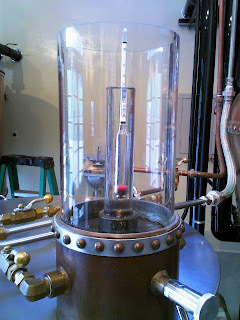 The distillate is clear, and the liquid is now cooled. Tim Welly, head of operations, and all around good guy. He is pasionate about his job. Hillrock Estate has out their Solaera Aged Bourbon right now, but will come out with a small selection of small-batch items over the next year. The quality is exceedingly great. We tried some samples not only of the Solera Bourbon, but of several of the newer products in production. Fantastic! Hillrock firmly confirms that the Hudson Valley is one of the new, and up-and-coming distilling regions in the US. 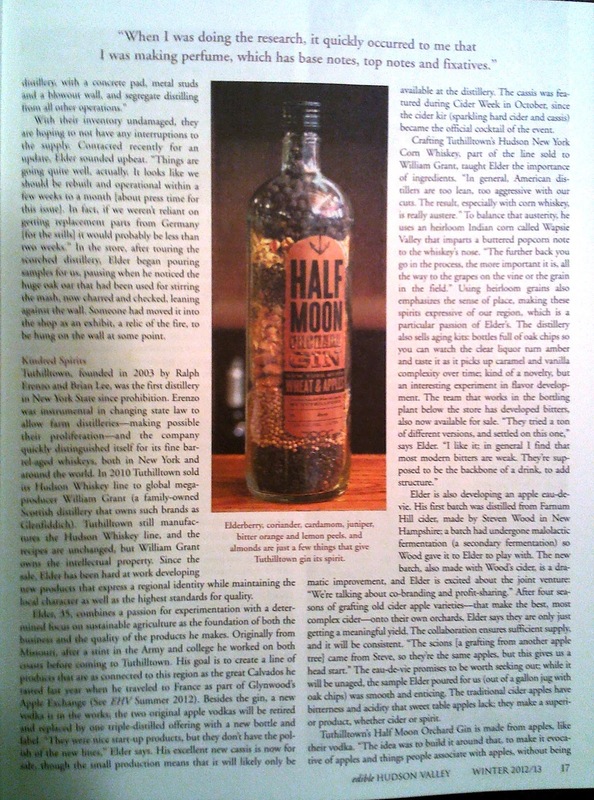 And helps to anchor the wine, beers, ciders, and spirits industry that has absolutely exploded in the Hudson Valley! 2012: "It Was A very Good Year"
o The wine grape harvest was one of the earliest ever, with average quanity and superb quality across virtually all grape varieties and regions. o New York wines won a record number of top medals in major international competitions, along with rave reviews in major consumer publications. o 17 new wine producer licenses were issued so far this year, bringing New York's total to 328, with at least 9 still pending. o "New York Drinks New York" has been an extraoridinarily successful promotion of New York wines in New York City. o "New York Farm Day" hosted by Senator Kirsten Gillibrand in September was bigger and better than ever. o Governor Andrew Cuomo dramatically conveyed his support of the wine industry with a late October Summit in Albany. While Hurricane Sandy had a lot of grape growers and wine makers biting their nails, New York's winegrowing regions suffered virtually no damage, especially compared with the City. Unfortunately, the Concord grape crop in the Lake Erie region (used for grape juice), which represents about two-thirds of New York's total grape acreage and tonnage, suffered a significant reduction due to a combination of the unusually warm winter followed by a late spring frost. But the wine grapes in that region, and in all others, fared very well in terms of quantity and especially quality. 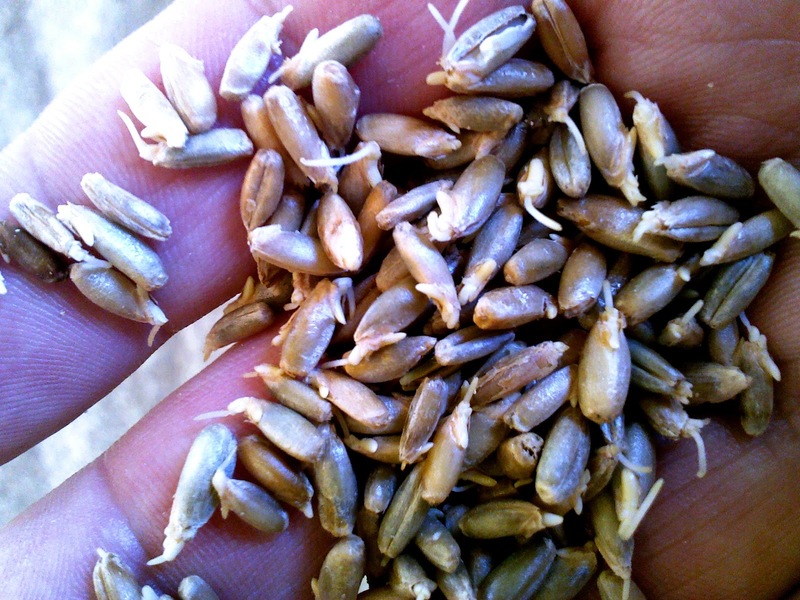 The warm weather throughout the year, especially in the summer and early fall, resulted in a harvest that was two to three weeks early in most places, minimizing the normal risk of a killing frost in October that could stop the ripening process and the harvest. While many winemakers were challenged by a compressed crush--with many varieties ripening at once rather than in sequence--the inconvenience was worth it in the end when they could put up their feet and celebrate with a beer a few weeks early. The 2012 harvest was similar in many respects to 2010, one of New York's best ever, so we eagerly await the wines as they start being released early next spring. Cheers! 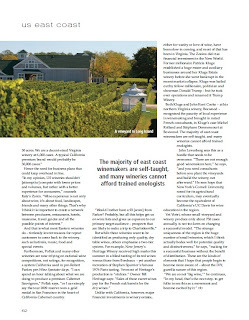 New York wines continued to wow wine competition judges and wine magazine reviewers with increasing recognition in 2012. In international wine competitions, New York wines received 88 "Best" designations, from "Best of Show" (of all wines in a competition) to "Best White Wine" (or red, rose, sparkling or dessert) and "Best Varietal" (chardonnay, riesling, merlot, etc.). Add to that 80 Double Gold medals (requiring unanimity among judges) along with 565 Gold medals, and it was a very good year indeed. The top awards (Best of Show) went to Chateau Frank 2006 Blanc de Noirs (Atlantic Seaboard Wine Competition), Chateau LaFayette Reneau 2010 Dry Riesling (New World International Wine Competition), and Swedish Hill Winery (Winery of the Year, Riverside International Wine Competition). The Best of Category designations from various competitions went to 21 Brix 2011 Ella's House White; Arrowhead Spring Vineyards 2009 Late Harvest Vidal Blanc; Casa Larga Vineyards 2009 Fiori Riesling Ice Wine; Chateau Franc 2006 Blanc de Noir; Dr. Frank 2010 Gewurztramner Reserve, and 2008 Late Harvest Riesling, Bunch Select; and Swedish Hill 2010 Late Harvest Vignoles. Dr. Konstantin Frank Vinifera Wine Cellars, which celebrated its 50th anniversary this year, fittingly had a particularly strong showing of awards throughout the country, including the Governor's Cup and Winery of the Year awards at our New York Wine & Food Classic. Complementing the wine competitions winnings are dozens of New York wines rated 90 or above by the three major wine consumer magazines: Wine Enthusiast, Wine Spectator, and Wine & Spirits. 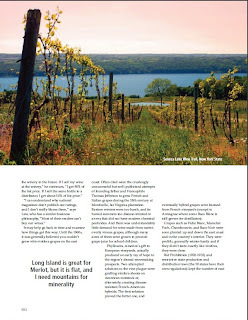 Of the 48 wines, 40 were Finger Lakes Rieslings, with scores reaching 93 points for Lamoreaux Landing 2011 Dry Riesling, Sheldrake Point 2010 Riesling, and Anthony Road 2009 Riesling, Martini-Reinhardt Selection (in both Wine Spectator and Wine & Spirits). Finally, while not as tangible as medals or scores, the attention focused on New York wines by other major publications--the New York Times, Wall St. Journal, Washington Post, and others--is further evidence of the quality and increasingly widespread reputation of our fine wines. 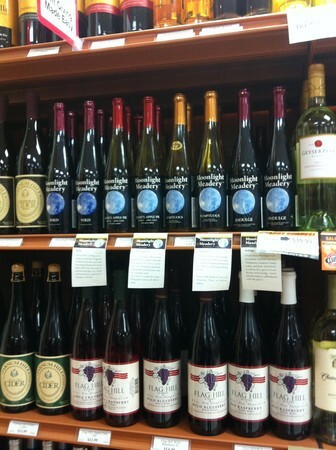 The award-winning wines are listed on our web site (www.newyorkwines.org) under "New York Gold"--the perfect shopping list for the holidays. 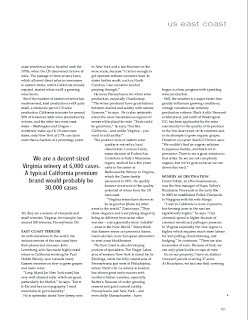 So far during 2012, 17 new winery licenses were issued by the New York State Liquor Authority, with nine others pending, and these numbers don't include the 10 satellite stores and 46 branch offices which are essentially remote tasting rooms for wineries. It is well worth noting that the New York State Liquor Authority has significantly expedited the license approval process, so some of the "pending" licenses may in fact be active by the end of this month. One of the services we provide at the New York Wine & Grape Foundation is essentially serving as an "incubator" for new wineries, with web-based information on licensing, business plans, grape varieties, and much more, supplemented with personal help as needed. The growth in new wineries has been accelerating, which we expect to continue in the future, and each new one means new investment, new jobs, new tourism, and new taxes for the State of New York. In 2008, the grape, grape juice and wine industry generated $3.76 billion in economic benefits for the State of New York--and with industry growth that number has clearly increased, probably to over $4 billion (see the "What's in a Bottle of Wine?" mini-poster on our web site. Wine: The Economic Engine. "New York Drinks New York"
That's the name of a major New York wine tasting for media, trade and consumers last March, but in a broader sense describes a major new initiative we have undertaken to promote New York wines in New York City. 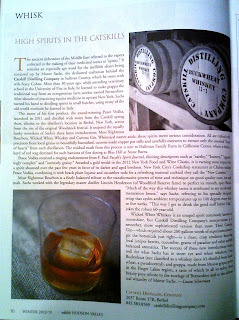 Thanks to a grant from the Genesee Valley Regional Market Authority supported by the New York State Department of Agriculture & Markets, we have been able to work with a superb, small Manhattan agency, First Press Public Relations, on a very creative "exchange program" introducing New York City to New York State, and vice versa. Basically, we bring New York City wine writers, sommeliers, and wine store managers to the various wine regions to get a first-hand understanding of their geography, people and wines. Then we bring representatives of the participating wineries into New York City for a thorough market orientation as well as networking opportunities. There were other aspects of the program as well, starting with fascinating and illuminating market research ("What does New York City think of New York wines? "); media relations; targeted advertising; and a mid-March wine tasting at Astor Center which drew an unprecedented throng of media, trade, and enthusiastic consumers. The first part of the second phase program (bringing City folks to the country) was completed about a month ago, with the New York City part scheduled for mid-March, including another blowout tasting. New York City is the most competitive wine market in the world, and we get no breaks as New Yorkers: we've got to earn our place in the sun just like everyone else. Ya gotta be there, and now we are. It may be an annual event (since 2002), but somehow New York Farm Day gets bigger and better every year. Senator Kirsten Gillibrand, who thankfully is a very active member of the Senate Agriculture Committee and a great advocate for our industry, is the host of the event and clearly has the respect of her Senate colleagues as well as members of the House, who enjoy the great food and beverages produced in New York. The food ranges from Long Island oysters to Chobani yogurt, New York apples and Mercer's Wine Ice Cream; and the beverages include wine, spirits, beer, cider, grape juice, apple juice and, of course, milk. The purpose of New York Farm Day is to tastefully educate official Washington that New York is a major farm state whose needs should be considered when shaping agricultural legislation like the (now-stalled) Farm Bill. There are many receptions on Capitol Hill, but Farm Day is one of the hottest tickets for a very simple reason: It's not just great food and great wine, but it's served by the people who actually produce these products (not some caterer). We (especially Jennifer Cooper) orchestrate Farm Day in close coordination with Senator Gillibrand's staff, which is absolutely top notch in all respects. We also know that the 600 or so people who show up are the ones we want (involved with policy) because it's an invitation-only event and they RSVP to us at the New York Wine & Grape Foundation. We look forward to Farm Day 2013 in September. On October 24, Governor Andrew Cuomo hosted a New York Wine, Beer & Spirits Summit in Albany, which also included hard cider as an emerging beverage category in the State. It was the start of a new era in New York for what I call the "farm-based beverage industry". Several hundred invitees gathered in the Albany Convention Center, where the Governor sat with his top Administration officials at a head table, flanked on each side by several leaders from the various beverage groups. Several of us were invited so convey the perspectives and issues affecting our sectors, and how the State could help create a better business climate for future growth. After two hours of dialogue and a one-hour recess for lunch, the Governor reconvened the Summit and, based on the morning's input, announced several significant legal or regulatory changes which would be implemented immediately (in fact, the next day the New York State Liquor Authority issued an advisory confirming that). He also announced the immediate availability of new funding to promote the farm-based beverages, including up to $2 million in matching funds if the industries could raise the equivalent amount in private sector dollars. Nearly 30 years ago, in 1984, a former Governor essentially saved New York's grape and wine industry by listening, then acting. His name was Mario M. Cuomo. 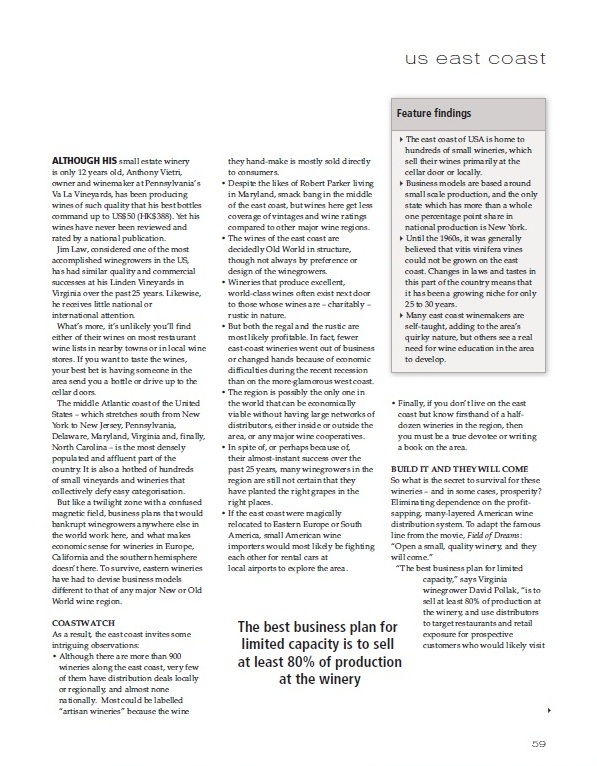 Governor Andrew Cuomo's 2012 Summit is the beginning of a process that almost surely will propel our industry and others to a whole new level. It's called "entrepreneurial government", and it works. It's a new day in New York. Cheers! 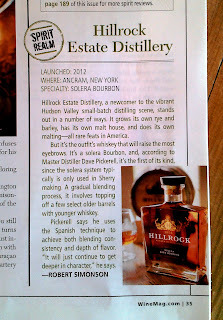 The newest issue of Wine Enthusiast has a wonderful review of Hillrock Estate Distillery in Ancram, NY by spirits journalist Robert Simonson. 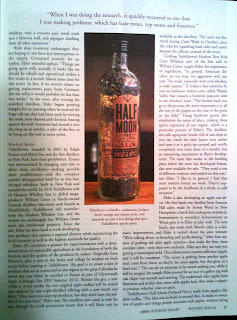 Another sign Hudson Valley distilling is coming on strong. 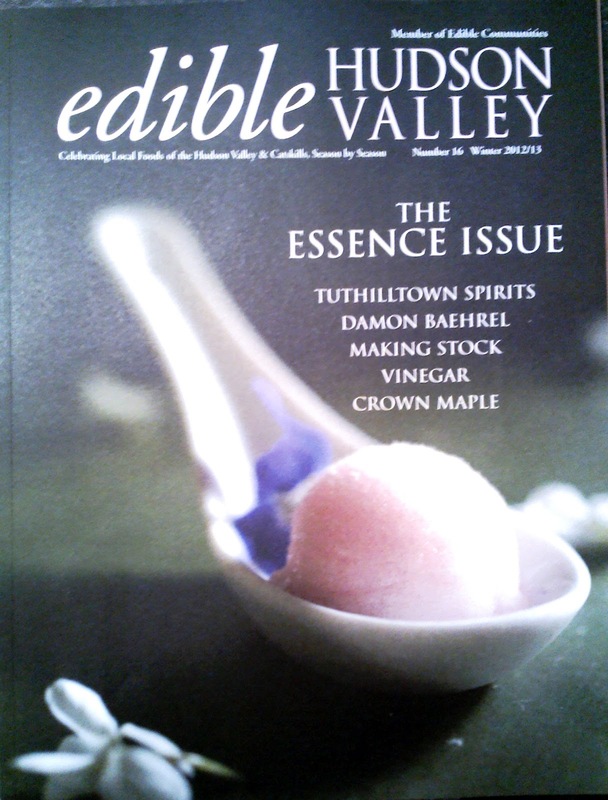 Edible Hudson Valley Features Tuthilltown Spirits in Winter 2012/2013 Issue! 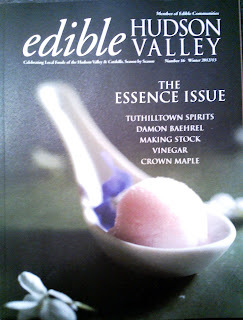 In the Winter 2012/2013 issue of Edible Hudson Valley Peter Barrett wrote a fantastic feature on Joel Elder and Tuthilltown Spirits. According to Barrett, "There has never been a better time to explore and enjoy spirits, and we're blessed with some serious talent in the Hudson Valley region." Congrats to Peter, Eric, Nancy and Ray at Edible Hudson Valley! 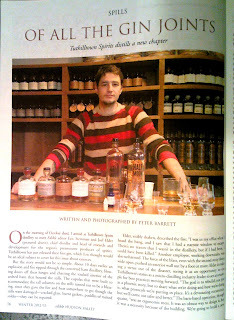 And congrats to Joel and Ralph at Tuthilltown Spirits! 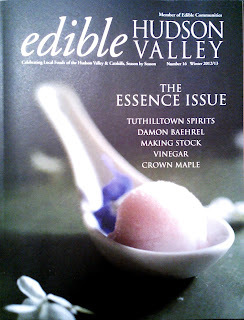 The folks at Edible Hudson Valley did a sort of small version of a distilling issue when they highlighted Catskill Distillery and Tuthilltown Distilling in the same issue! 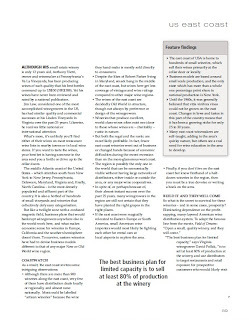 The piece below is from the new Winter 2012/2013 issue. 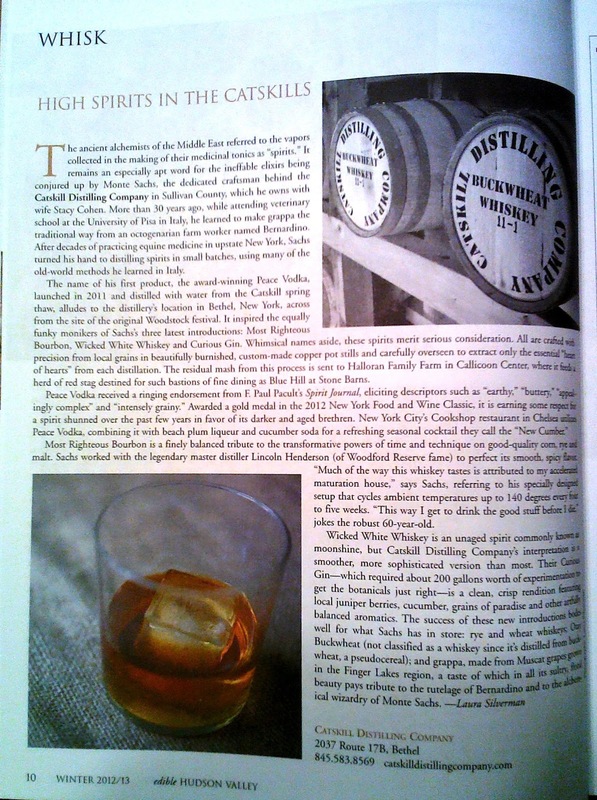 Laura Silverman wrote the article entitled "High Spirits in the Catskills"
Nice to see this kind of coverage of Farm Beverages in the Hudson Valley!! Congrats Laura, Eric, Nancy and Ray! Recently I wrote of a run my brother-in-law Robin Hoover and I made down to the wine cellar Thanksgiving Day evening, to choose among my older dessert wines to sip in front of the fireplace. One of the several bottles I pulled was a Heron Hill Late Harvest Riesling 2002. I have tasted a lot of Heron Hill it seems to me this year. But that’s not a bad thing, in fact, I think it’s a good thing. I like what they are doing. The whites are crisp and clean, and the reds are bright and with nice fruit and solid structure. And the addition of Bernard Cannac to this winery instantly made an impact on the wines coming out. There’s no doubt you can taste and appreciate his influence. There’s lots of exciting stuff going on over at Heron Hill. But in tasting this wine, this is a look backwards…into their past. And one of the things that Heron Hill has always been able to do is to make great late harvest and ice wines. So I was excited to try this Heron Hill Late Harvest Riesling 2002. The wine was light golden in color. It was sultry in the glass, swirling slowly, coating the inside of the bowl with its sweet, luscious fingers. It’s not a super thick wine like an ice wine. And it’s not as sweet either. There is the hint of orange marmalade and some hints of citrus along with honey and apricot. I read somewhere that there was quince? I have to say that did come through. On the palate was a nice, soft acidity helped balance the wine as well. This is an extremely lovely wine. Again. Not the heavy, sweet bomb, but a more refined, elegant dessert wine. 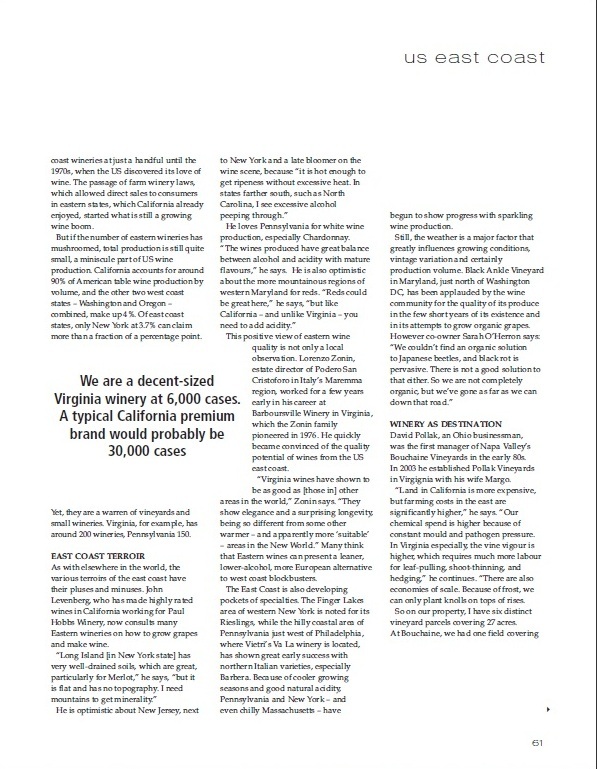 Roger Morris writes about how wines from the East Coast are gaining a reputation and fans...among wine drinkers, and the cogniscenti! A great article. Lots of wonderfulw ineries, from New York to Maryland, New Jersey, Pennsylvania, and Maryland are all mentioned. It's a great view from the outside in. Incredible!